Incredibly creamy and delicious chicken and potato gratin made in one dish with only three main ingredients: chicken quarters, potatoes and cream. 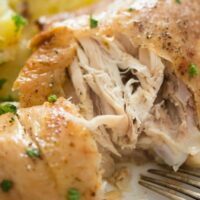 This easy potato gratin with roasted chicken quarters is one of the most comforting and delicious chicken meals you can imagine!!! No kidding! Not really diet food, but you will love this chicken potato bake so much, you will keep making it. 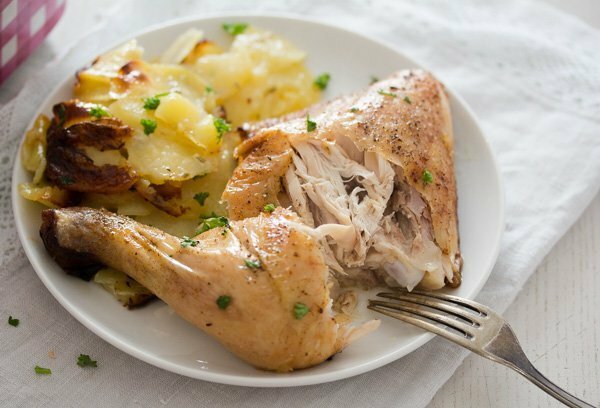 Not to mention that you will only need three ingredients to make the chicken and potato bake and that the recipe is also super easy to make. One meal in one casserole dish: a soft, creamy and delicious potato gratin and the crispy and tender roasted chicken quarters on top of it. As mentioned above, there are only three main ingredients you will need for this easy potato gratin with chicken quarters. Starchy potatoes are the best choice for potato gratin or potato dauphinoise . 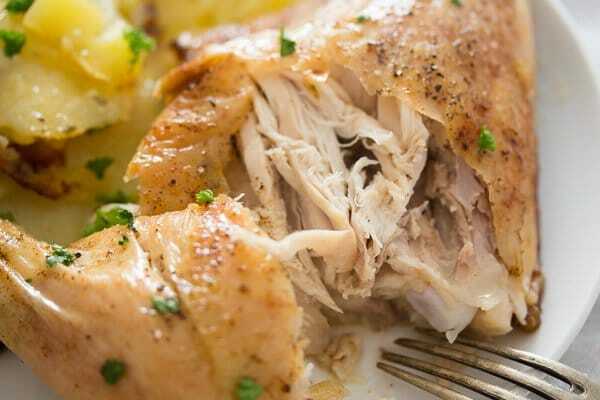 They will breakdown in that cream sauce and become soft and creamy, the perfect “bed” for the crispy and delicious chicken quarters roasted on top. 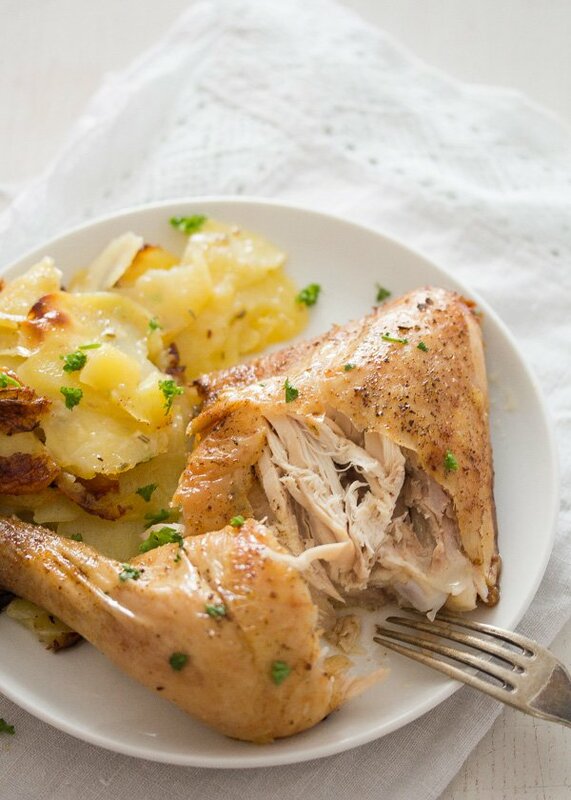 The only “thing” about this easy potato gratin with chicken is the slicing of the potatoes. The slices have to be really thin in order to make sure that the potatoes will be perfectly cooked in the one hour baking time. You can slice the potatoes for the potato gratin with a sharp knife, but this will take its time and you have to make sure that all the slices are equally thick.
. This way you will have all your potatoes ready in no time. I used chicken quarters to make this easy potato gratin with chicken. Chicken quarters are the most common cut of chicken in Germany, together with the boneless skinless chicken breasts. Buying only drumsticks requires a bit of know-how, meaning you have to know which supermarket or butchers sells them and go there. Just hoping to find some in the village supermarket is not the right strategy when you really want to cook a dish using only drumsticks. So, most of the times I buy whole chicken quarters and divide them at the joint myself. I use either the thighs or the drumsticks and freeze the rest for the next recipe. And using chicken quarters and cutting them myself as required is also less expensive than buying the chicken legs already separated. But I am particularly happy when I cook chicken quarters without having to separate them first. I do that a lot actually, especially when roasting chicken. The chicken quarters have more skin and fat than the already trimmed chicken drumsticks and thighs. As the chicken quarters are roasted on top of the potato gratin, all of the rendered fat will remain in the dish and will help cook the dauphinoise potatoes, making them even more delicious than regular potatoes au gratin already are. But, of course, we don’t want to overdo it with the fat, otherwise the dish will become too heavy. So, make sure you remove all the extra fat and skin wobbling on the underside of the chicken thigh. Only leave the skin surrounding the drumstick and the skin on the upper side of the chicken thigh. The last main ingredient is the cream, you will need about 125 ml/ ½ cup heavy cream. Otherwise, you will need 1 garlic clove, some sweet paprika powder, some fresh or dried thyme and rosemary, salt and pepper. 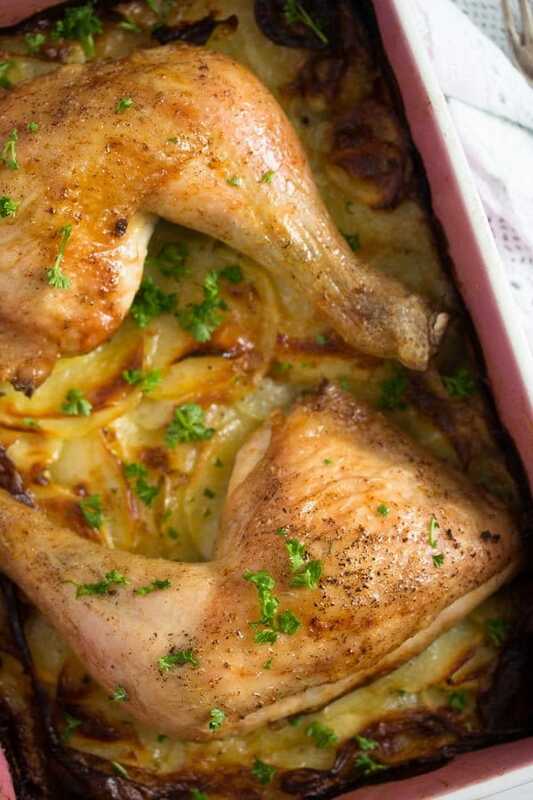 This recipe for this chicken and potato bake serves two, three at the most. The recipe can be easily doubled, but you will have to use a larger casserole dish that will fit four chicken quarters. 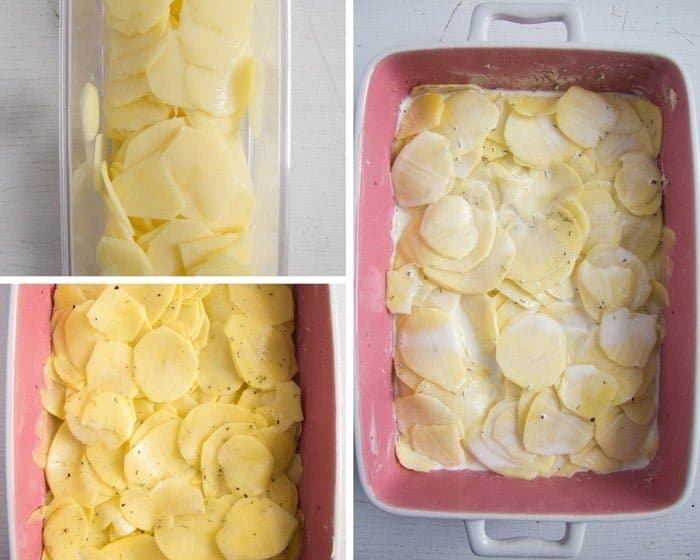 Step 2: Spread the potato slices into a lightly buttered casserole dish of about 20×25 cm/ 8×10 inches. Step 3: Mix together the heavy cream, grated garlic and herbs. Add ½ teaspoon fine sea salt and black pepper. Pour the mixture over the potatoes and shake the casserole dish slightly to ensure that the cream is evenly distributed in the dish. Step 4: Remove the fat and skin wobbling on the underside of the chicken thigh. Only leave the skin surrounding the drumstick and the skin on the upper side of the chicken thigh. Pat the chicken quarters dry with kitchen paper. Rub well with salt, pepper and sweet paprika. Place the chicken legs on top of the potatoes. 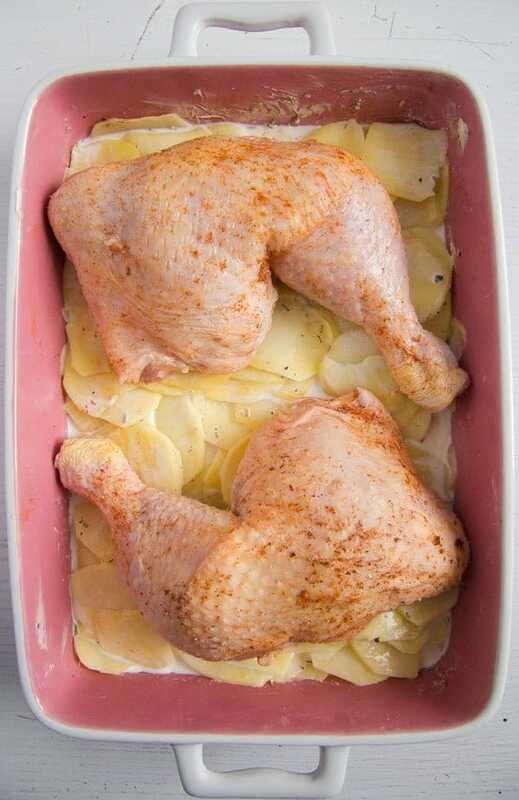 Step 5: Bake the potato gratin with chicken quarters in the preheated oven for 1 hour or until the chicken is cooked through and the potatoes are soft. To check if the chicken is cooked through, pierce it in the thickest part of the thigh, the juices should run clear. Preheat the oven to 220 degrees Celsius/ 430 degrees Fahrenheit. Lightly butter a casserole dish of about 20x25 cm/ 8x10 inches. Peel the potatoes and slice them thinly, about 2-3 mm/ 0.07 – 0.11 inches thick. Using a mandolin/slicer makes things easier and faster. Spread the potato slices in the prepared casserole dish. Mix together the heavy cream, grated garlic and herbs. Add ½ teaspoon fine sea salt and black pepper. Pour the mixture over the potatoes and shake the casserole dish slightly to ensure that the cream is evenly distributed in the dish. Remove the fat and skin wobbling on the underside of the chicken thigh. Only leave the skin surrounding the drumstick and the skin on the upper side of the chicken thigh. Pat the chicken quarters dry with kitchen paper. Rub well with salt, pepper and sweet paprika. Place the chicken legs on top of the potatoes. 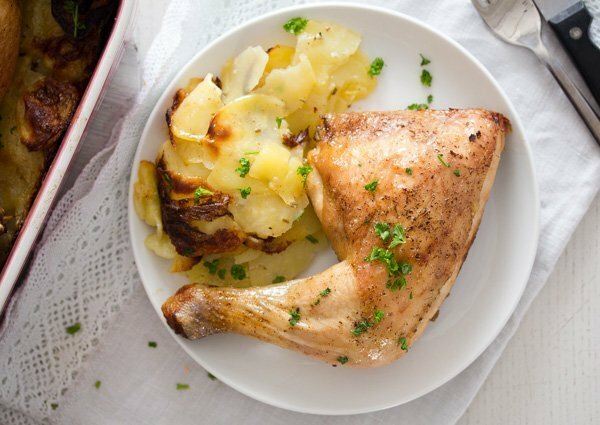 Bake the potato gratin for 1 hour or until the chicken is cooked through and the potatoes are soft. To check if the chicken is cooked through, pierce it in the thickest part of the thigh, the juices should run clear. Note 1: Preferably starchy potatoes, like Russet in the US, King Edward – UK or Augusta (mehligkochende Kartoffeln) – Germany. Note 2: Use fresh herbs, if available, about 2-3 sprigs thyme and 1 sprig rosemary. Chop the leaves finely and discard the stems. Now I know what to cook for our dinner tonight. 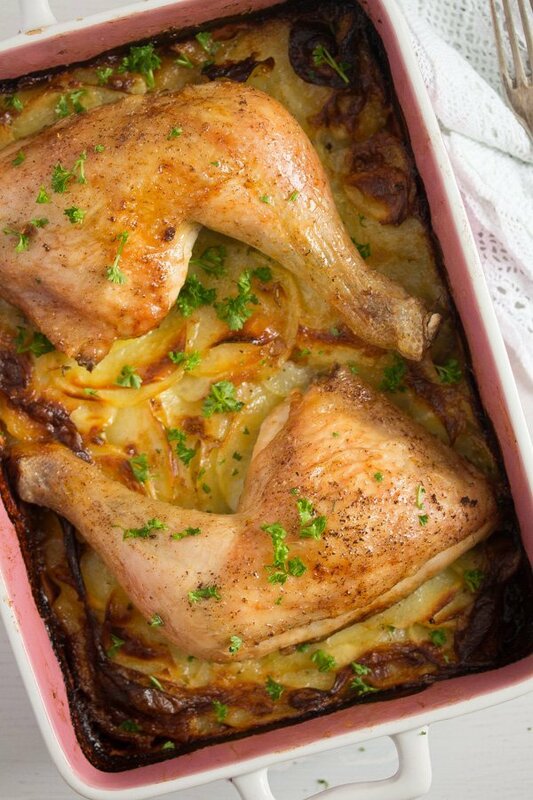 The photos of this potato gratin with roasted chicken is simply amazing and delicious. Thank you for sharing this recipe. Pretty sure that my family will love this dish. That gratin looks so GOOD! A very satisfying and moreish meal, Adina. Oh, how utterly delicious! Can’t wait to try this out. Pinned.